NCDEA Pacific Region Representative Tom Salzer gave this presentation to the conservation commissions from Idaho, Oregon, and Washington on Tuesday, August 7, 2018. 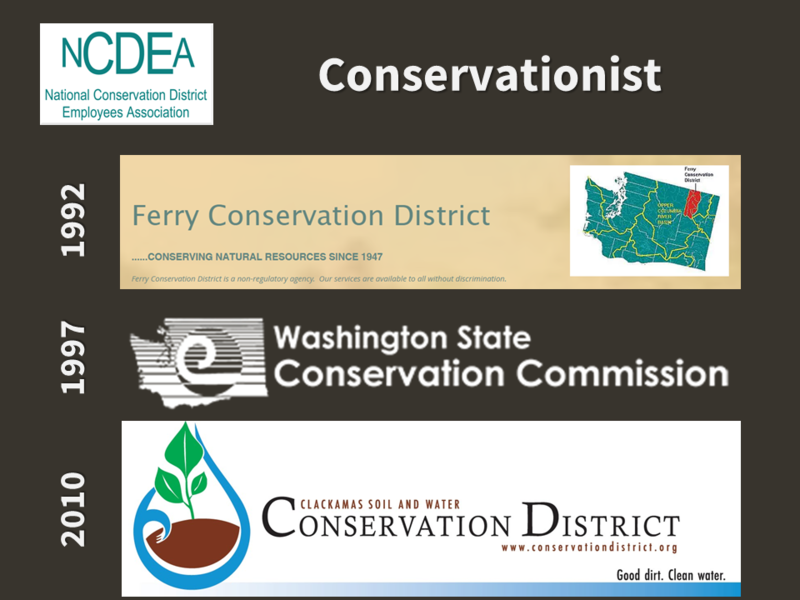 Those commissions meet together from time to time to discuss their programs and explore opportunities to leverage the work each is doing. 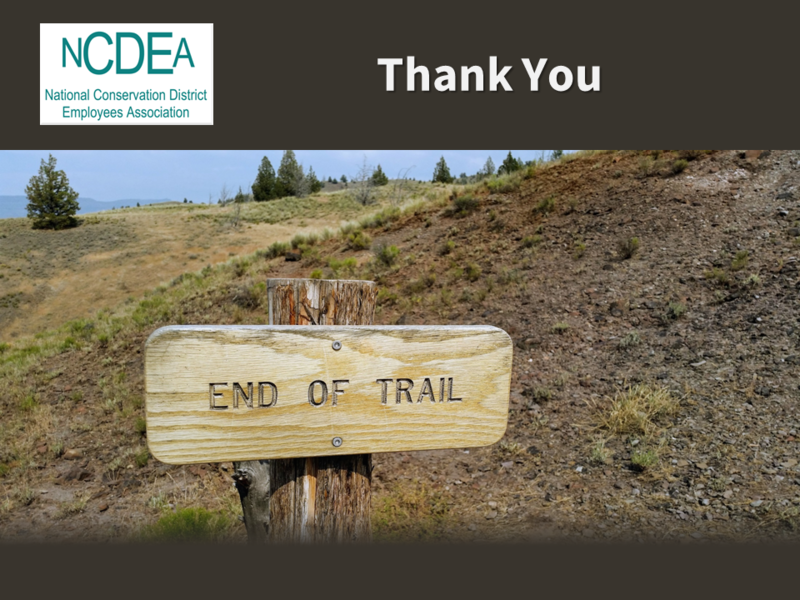 The presentation as published here is structured as a series of images (a gallery) with explanatory text as captions. 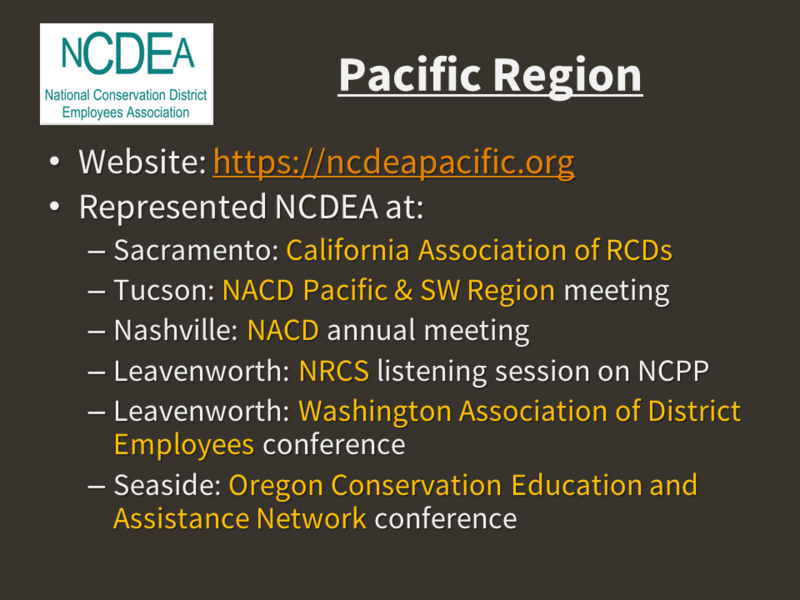 Please contact the Pacific Region rep if you would like a copy of the PowerPoint presentation. 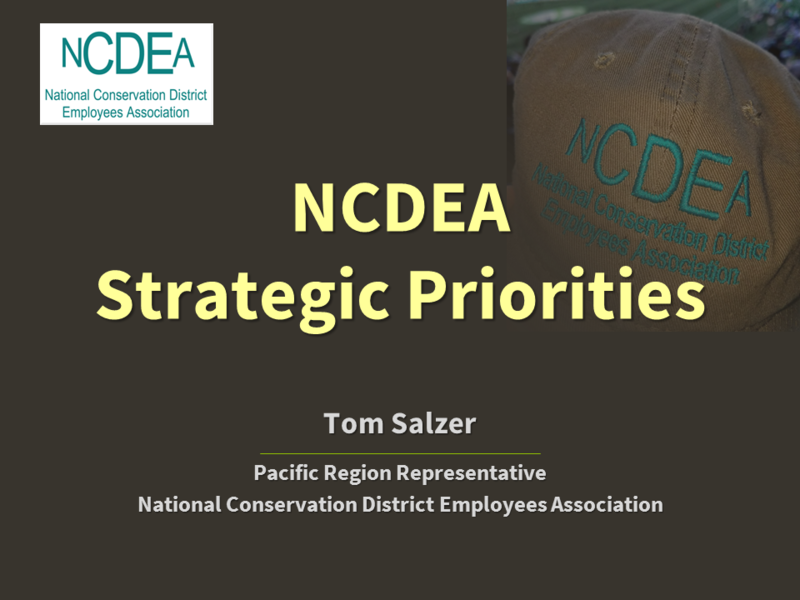 Today’s topic is the strategic priorities of the National Conservation District Employees Association. 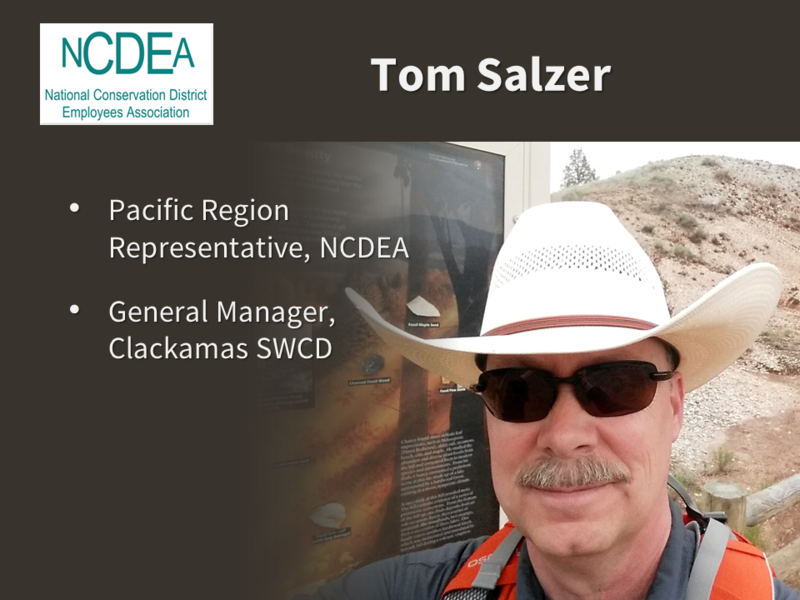 My name is Tom Salzer. 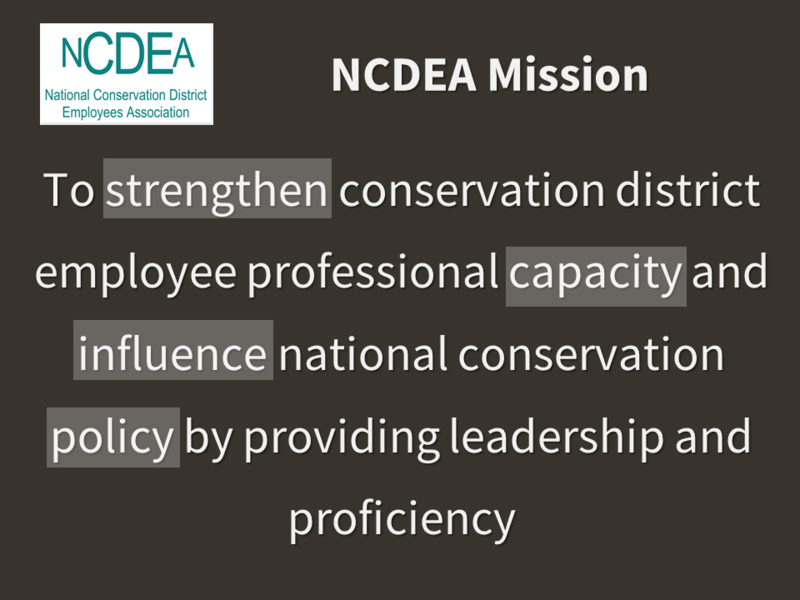 I am honored and humbled to be here today, representing NCDEA’s 7,000 members across the country. 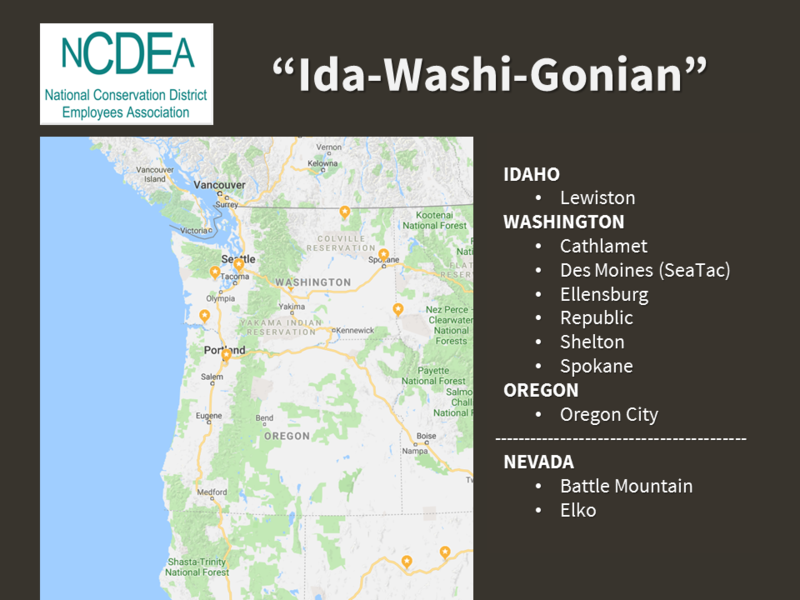 I’m an “Ida-Washi-Gonian” having been born and raised in the three states represented here today. 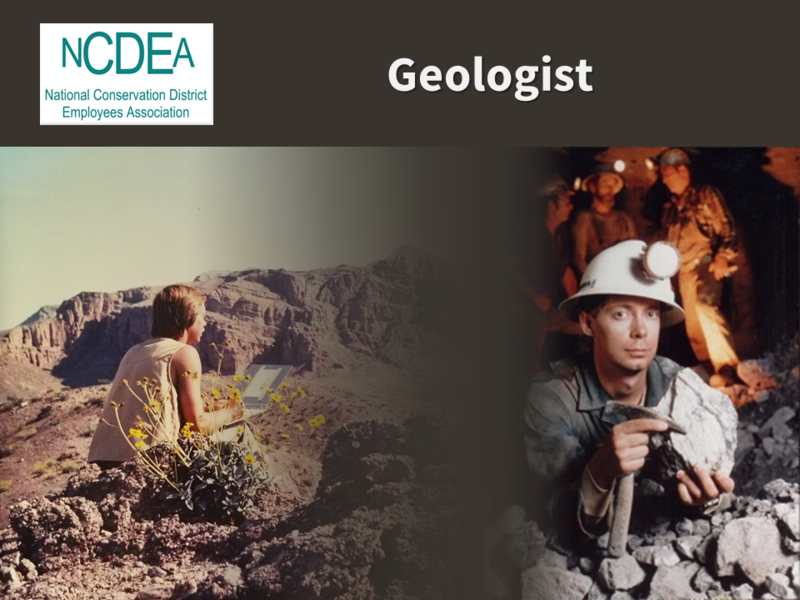 My first career was economic geology. I use much of this knowledge and experience in my current job. 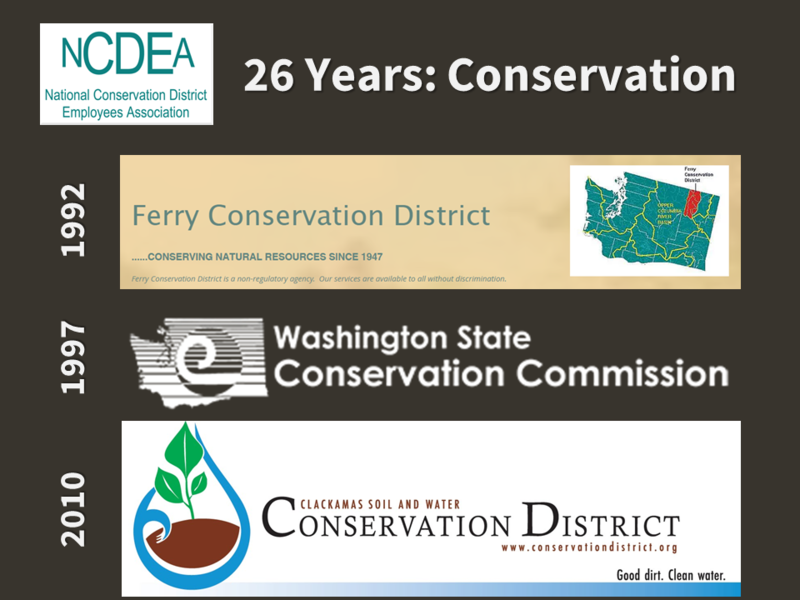 I have been in the conservation district family for 26 years. 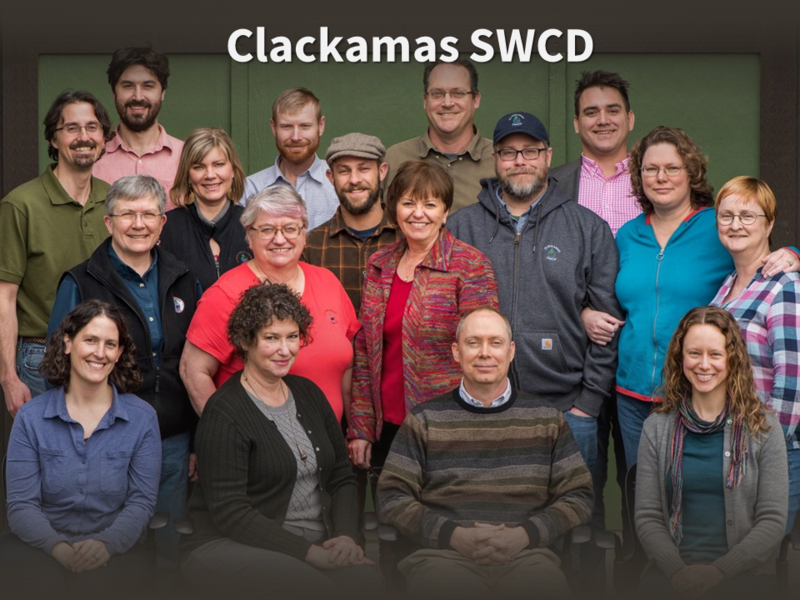 My crew at Clackamas SWCD is exceptional. 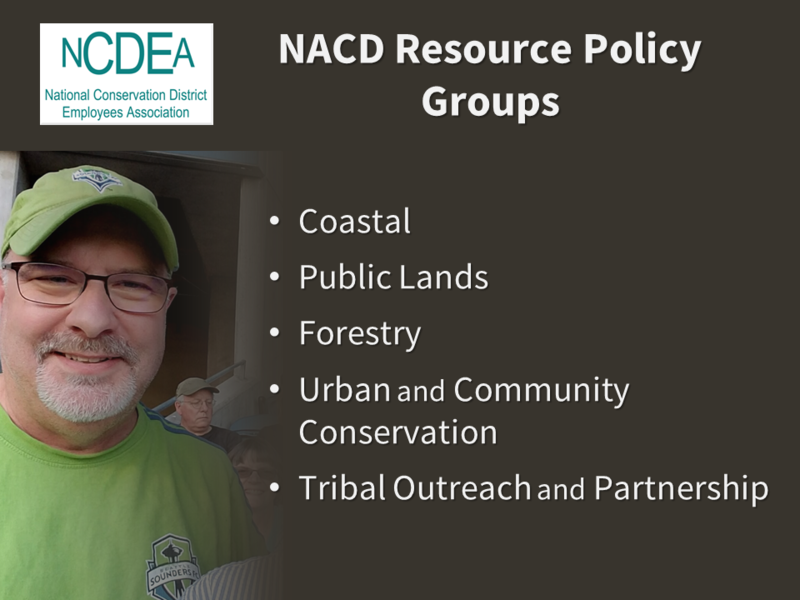 We serve 400,000 people from dense urban neighborhoods to wilderness on the slopes of Mt. Hood. 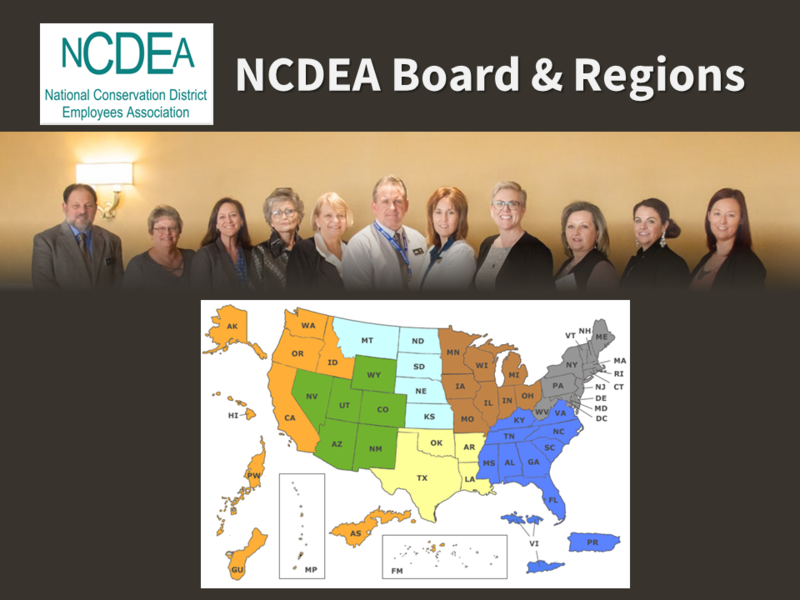 The NCDEA board consists of officers and regional representatives. The Pacific Region is the most geographically dispersed region. 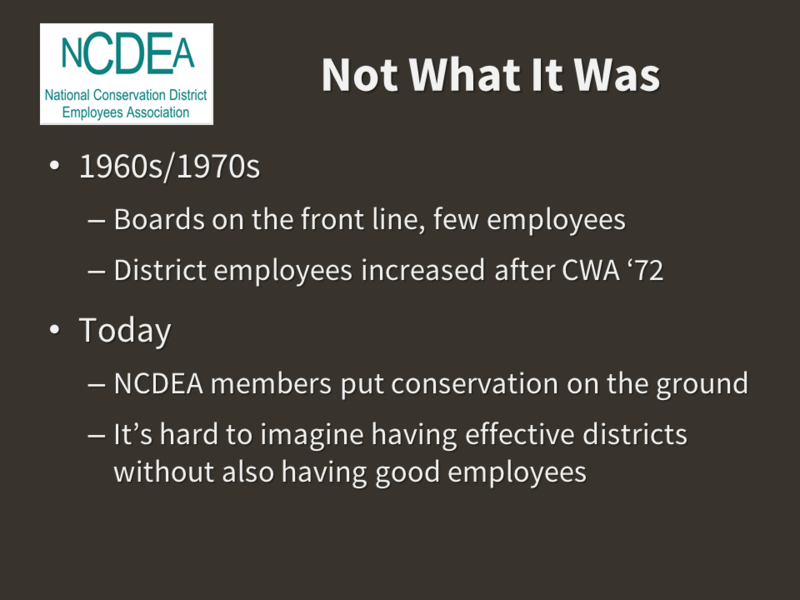 The idea of NCDEA is not new, dating back to 1984. 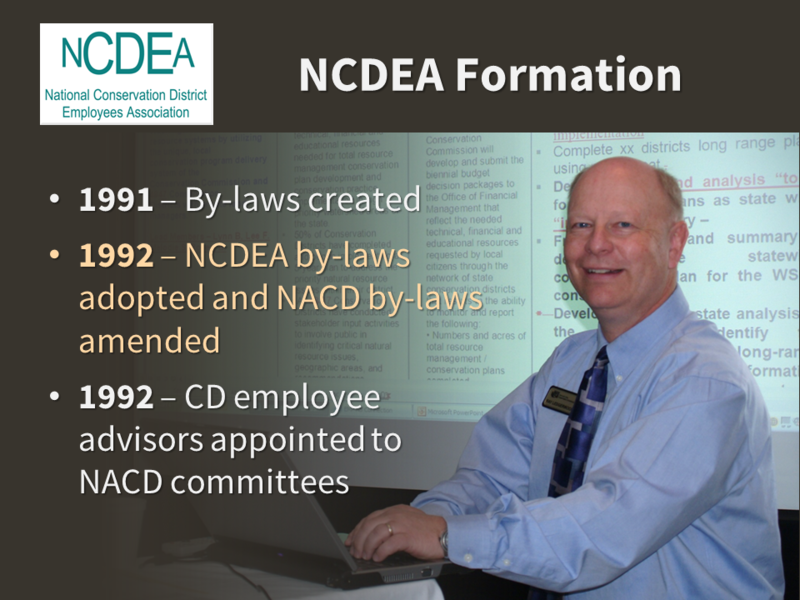 Ray Ledgerwood helped craft the first by-laws for NCDEA. 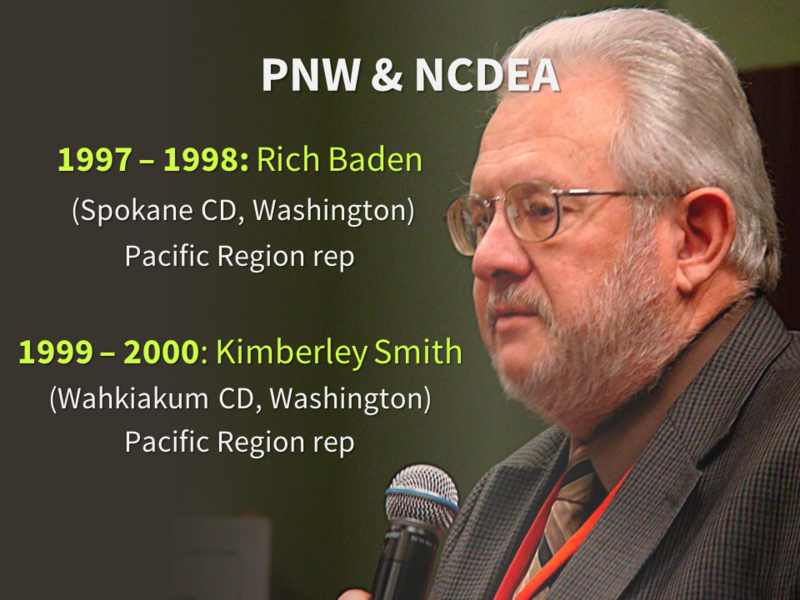 The connection between NCDEA and the Pacific Northwest is long and strong. 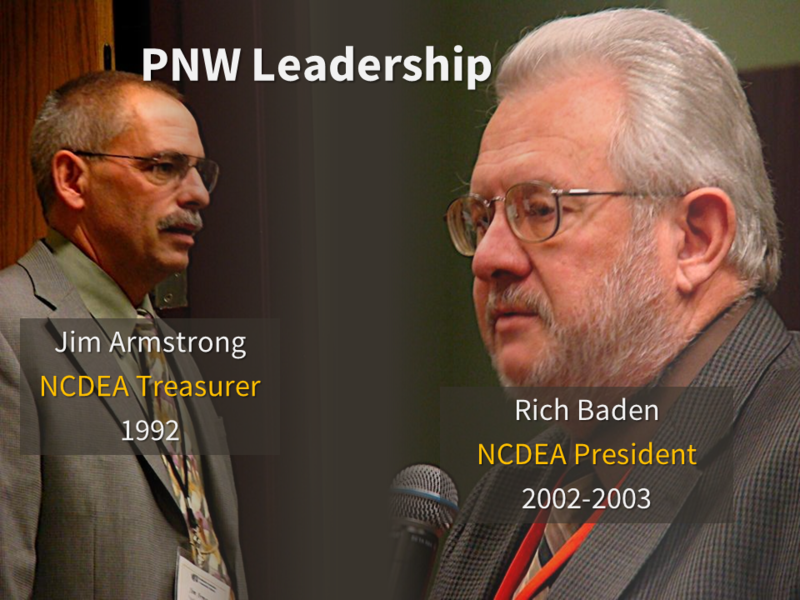 Past-president Rich Baden also hailed from Spokane. 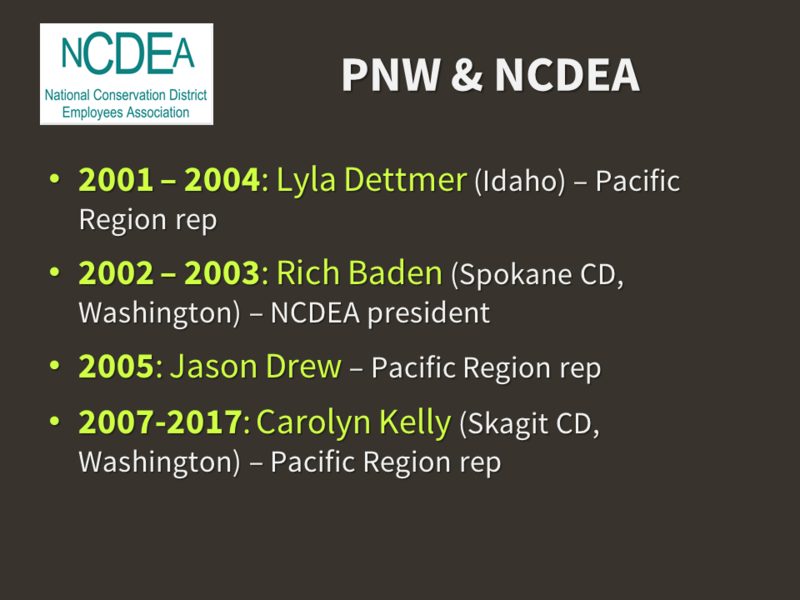 Carolyn Kelly had a solid 10-year run as Pacific Region Representative. 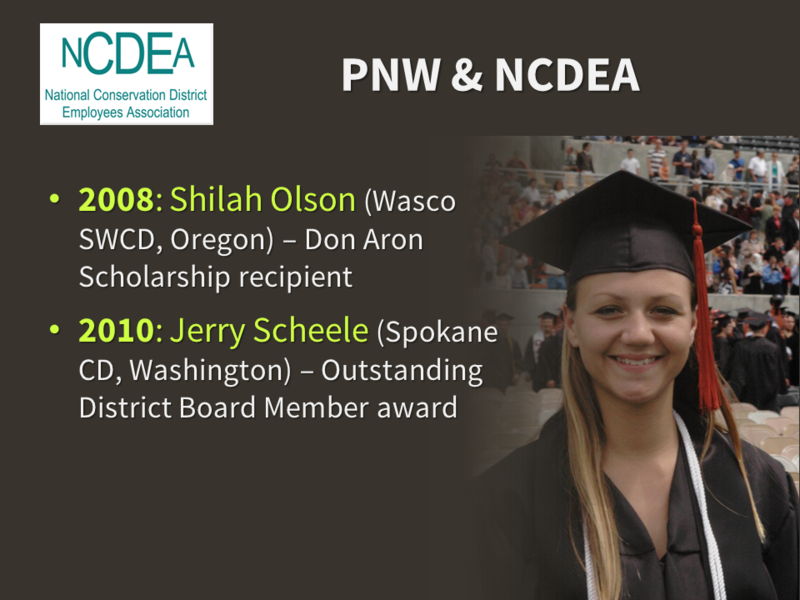 Shilah Olson received a scholarship from NCDEA and long-time Spokane CD Supervisor Jerry Scheele received national recognition from NCDEA. I was appointed in 2017. 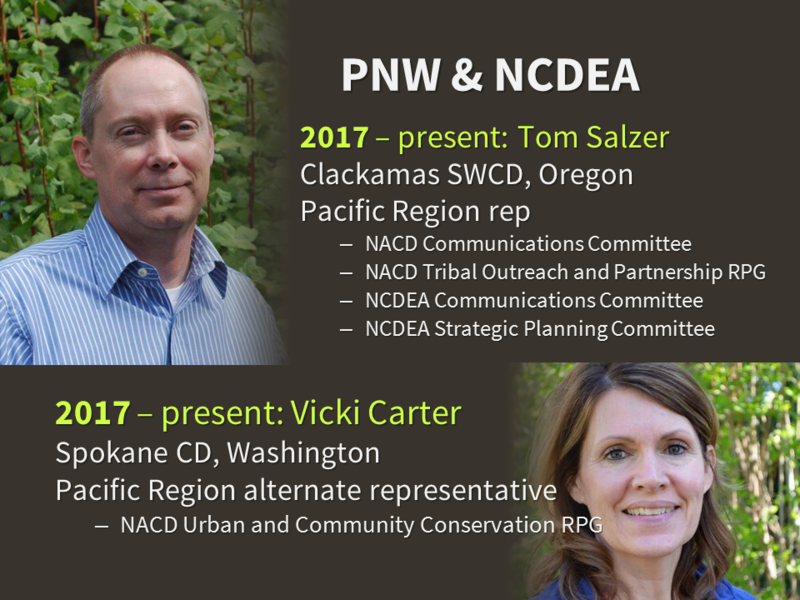 President Tim Riley also appointed Vicki Carter as our alternate representative for the Pacific Region. 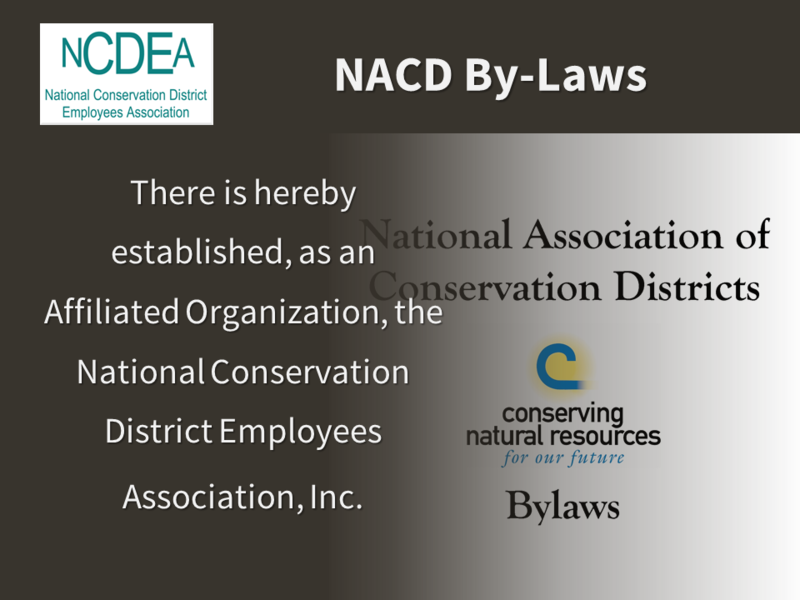 NCDEA is an “affiliated organization” in NACD’s by-laws. We are helpmates to NACD just as district employees are helpmates to district boards. 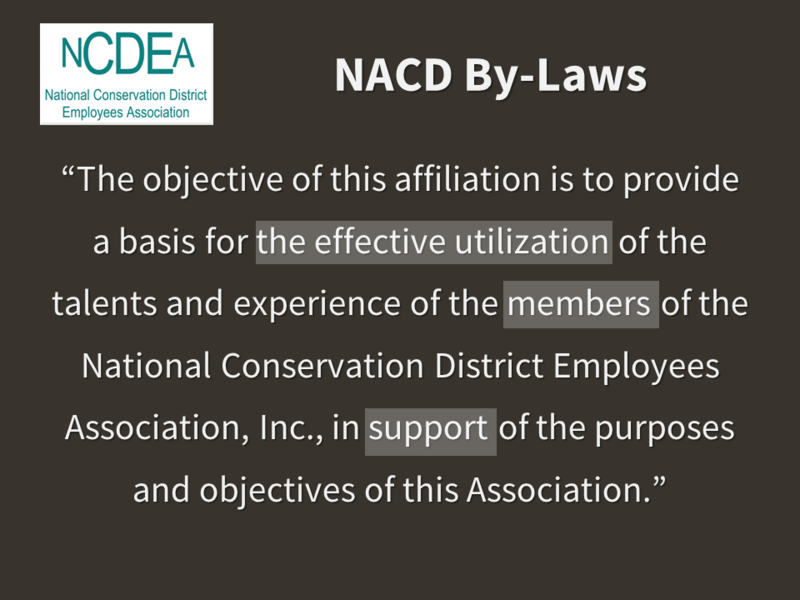 NACD by-laws describe the purpose of the affiliation. …and on several NACD resource policy groups. 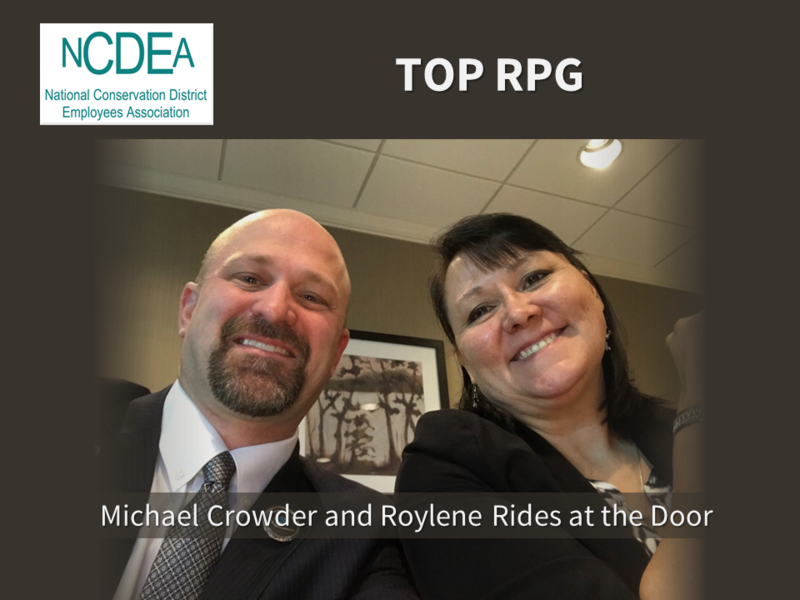 The Tribal RPG is wonderfully led by NACD Second VP Michael Crowder and NRCS State Conservationist for Washington Roylene Rides at the Door. 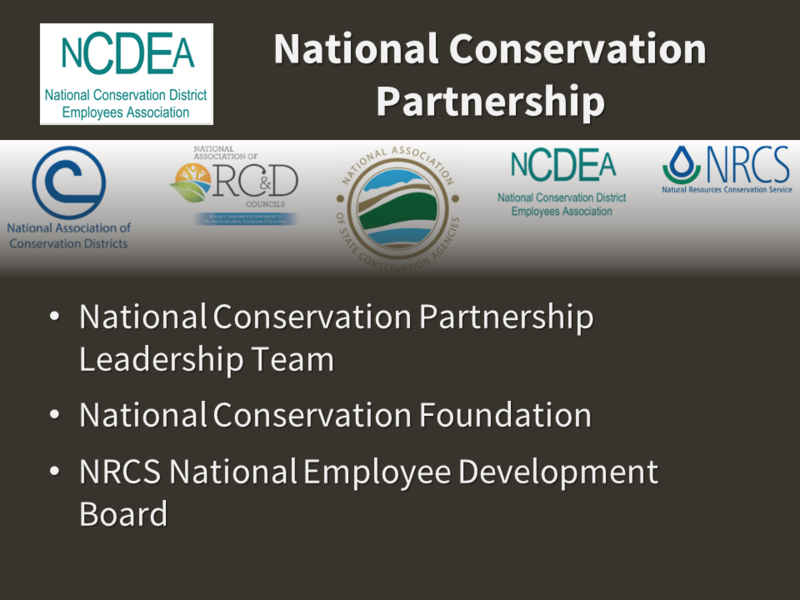 NCDEA is a core partner in the National Conservation Partnership. 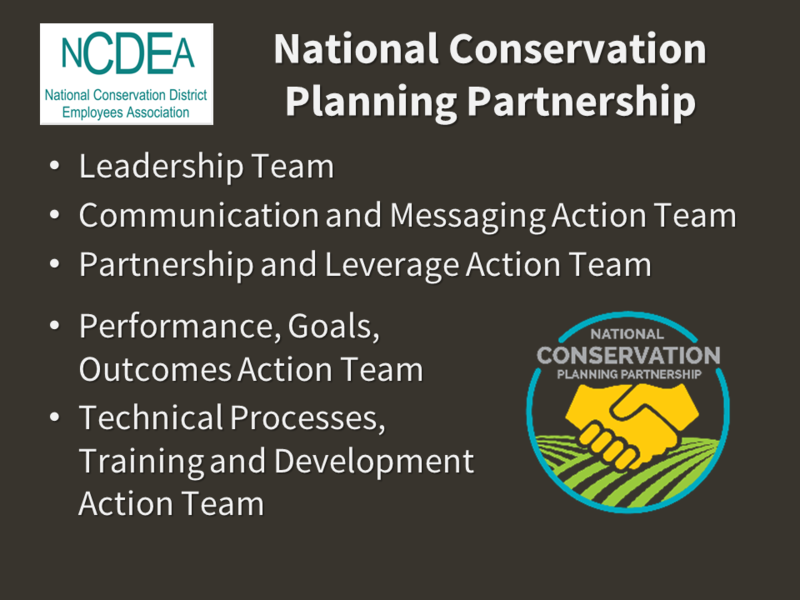 We are a core partner in the National Conservation Planning Partnership. 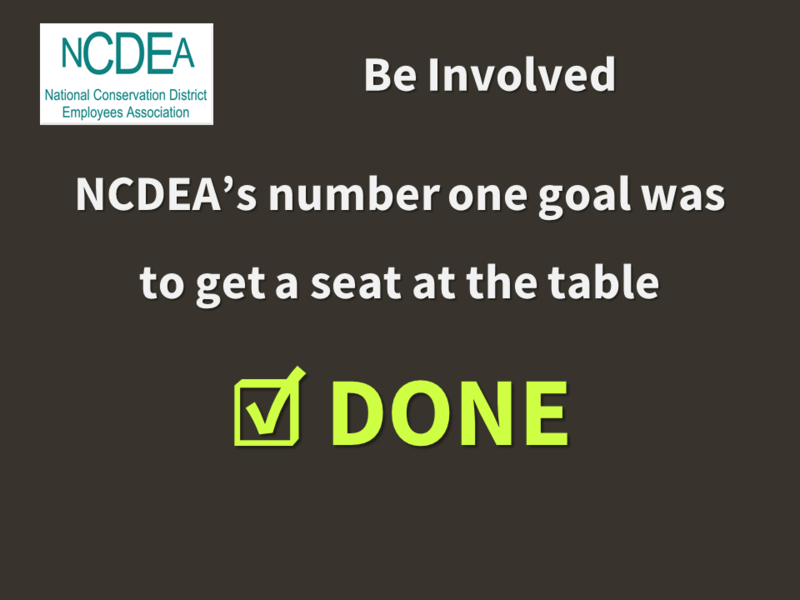 Our number one goal has been to get a seat at the table. Check that box. We’ve done that. So now what? 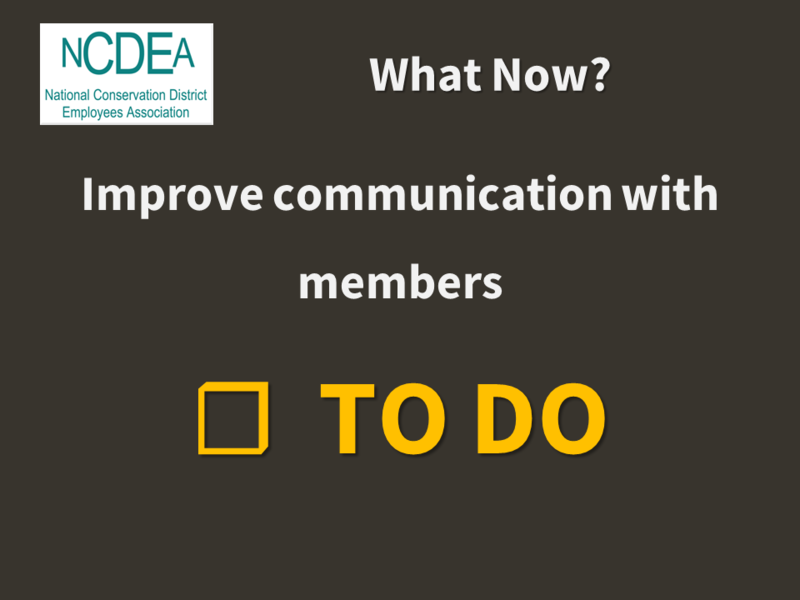 Now we need to do a better job communicating with our members. That is at the top of our “to do” list. 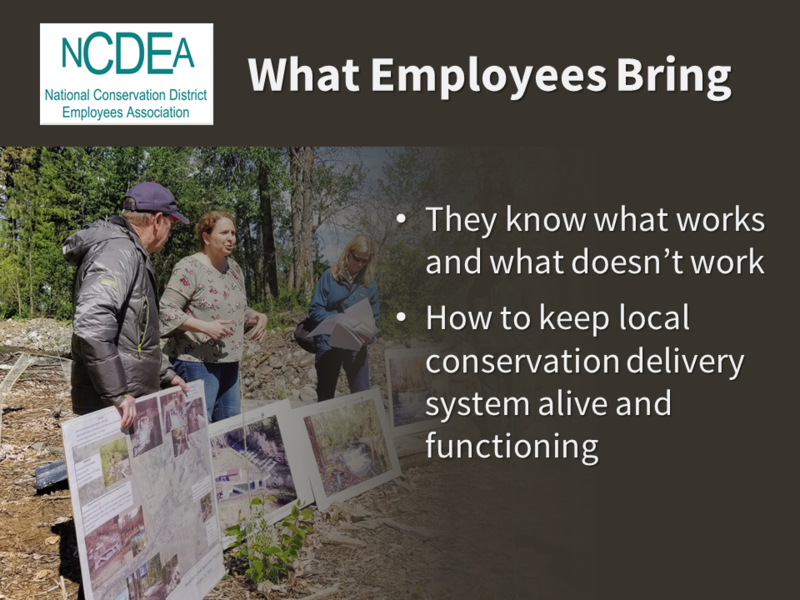 Employees bring special knowledge to national discussions. 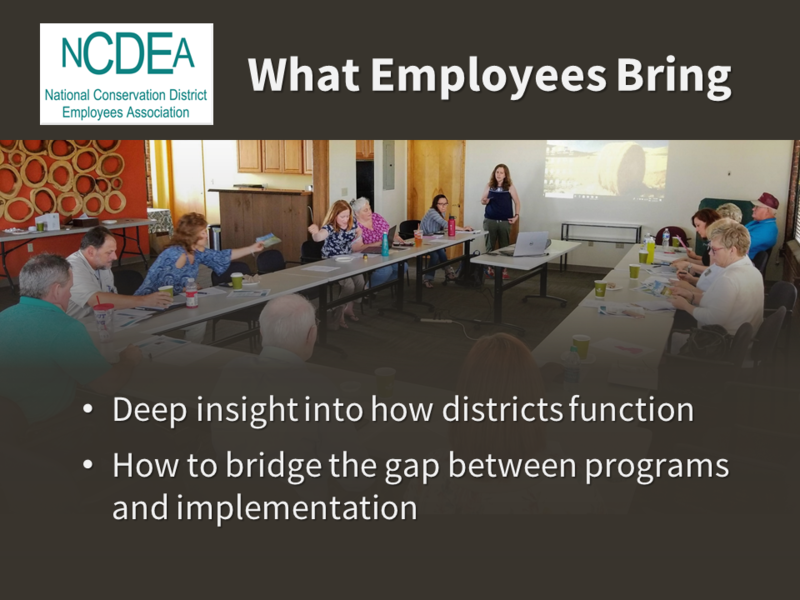 District employees know how to take programs created by people who probably have never worked in a conservation district and make them work well in their local communities. 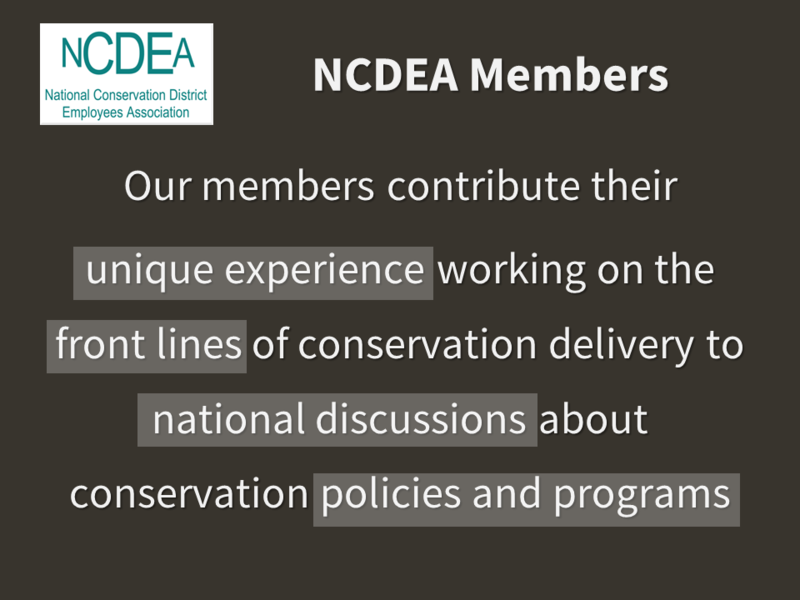 We bring our unique experience and perspective to discussions about national policies and programs. We need you. And you need us. You need districts to be successful for your programs to be successful. They need you to provide the guidance, accountability, and resources that help them succeed. Today’s world is not what it used to be. 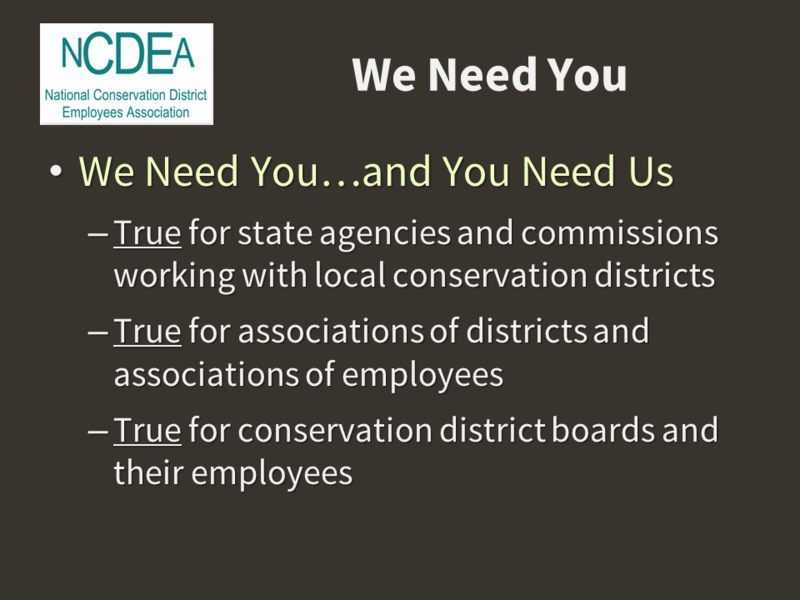 State agencies and commissions like yours are the glue that helps keep our diverse system together. And you provide the grease that helps keep it running. 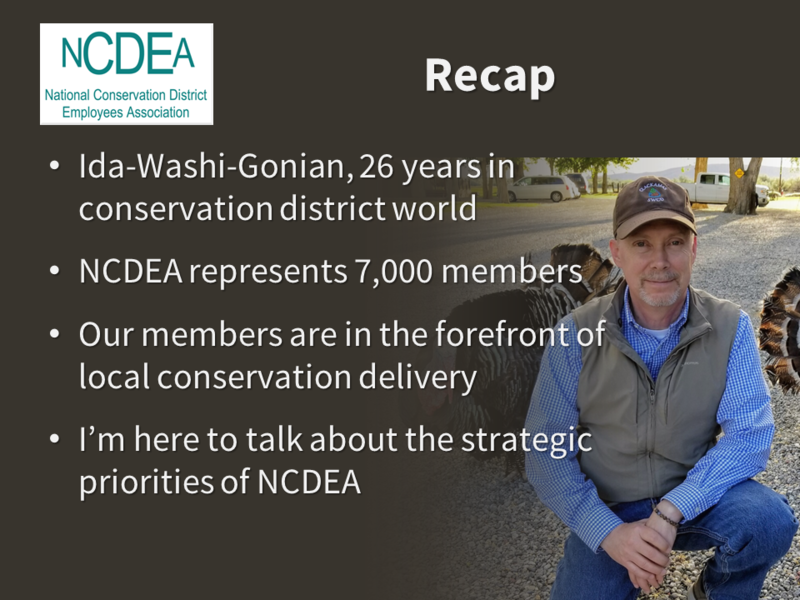 Recap…and now let’s talk about NCDEA’s strategic priorities. 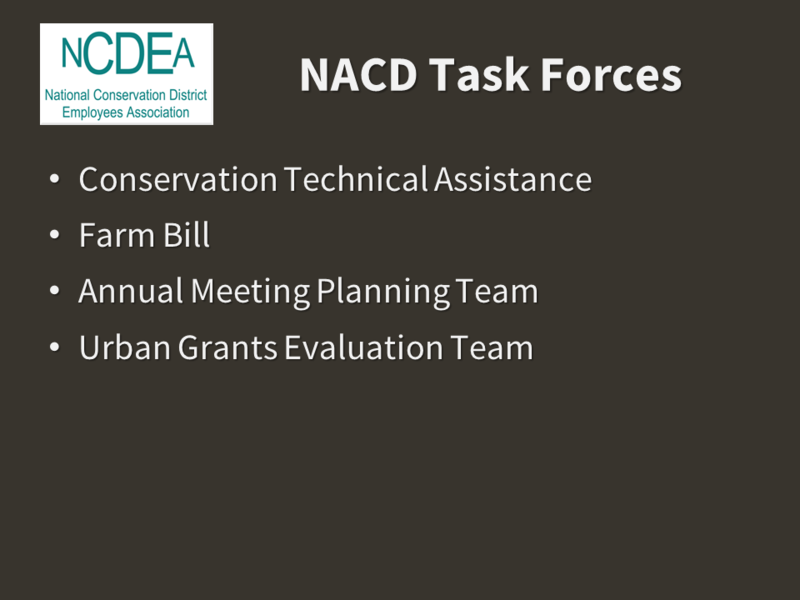 We currently have 8 strategic priorities that revolve around these topics. Today I’ll only talk about the 4 priorities that are most urgent. 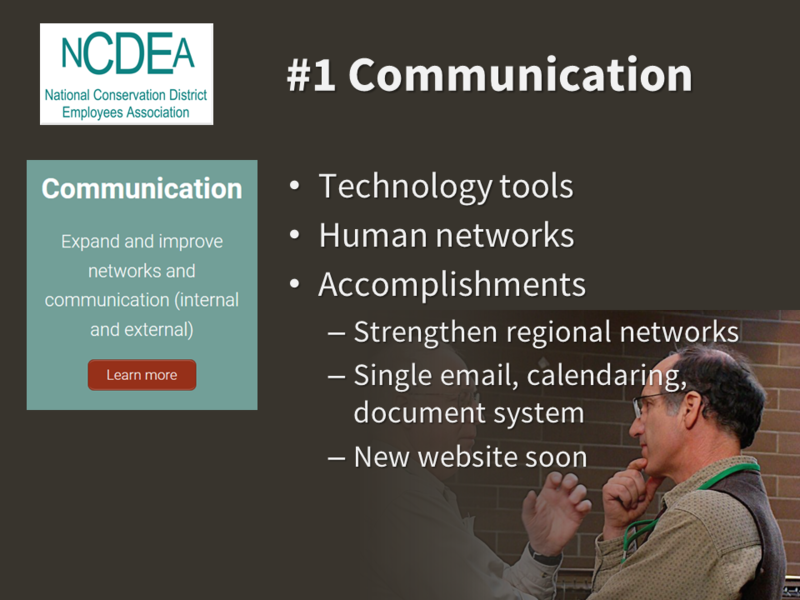 #1 on everyone’s list is improving communication. We are focusing on the human network part of this. 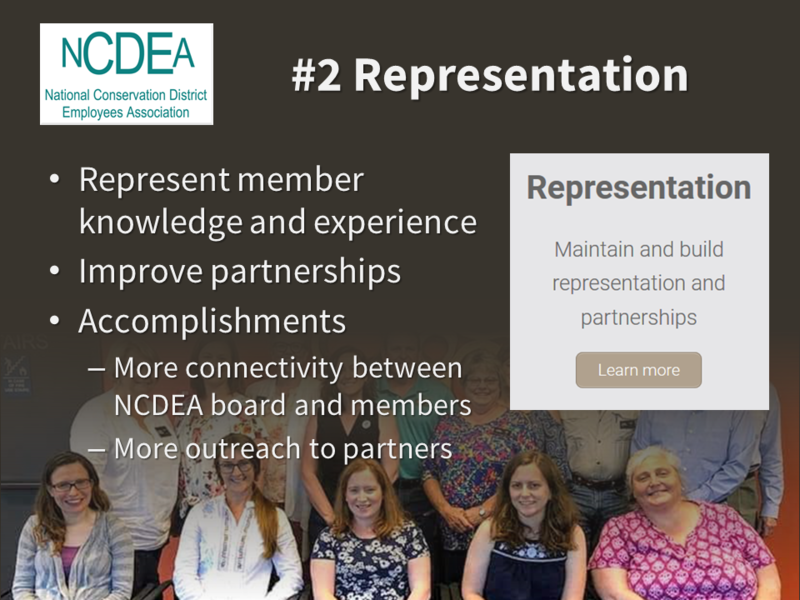 #2 — We need to do a better job of gathering and sharing what our members know, and build better, stronger partnerships. My being here today is an example of reaching out to more of our partners. 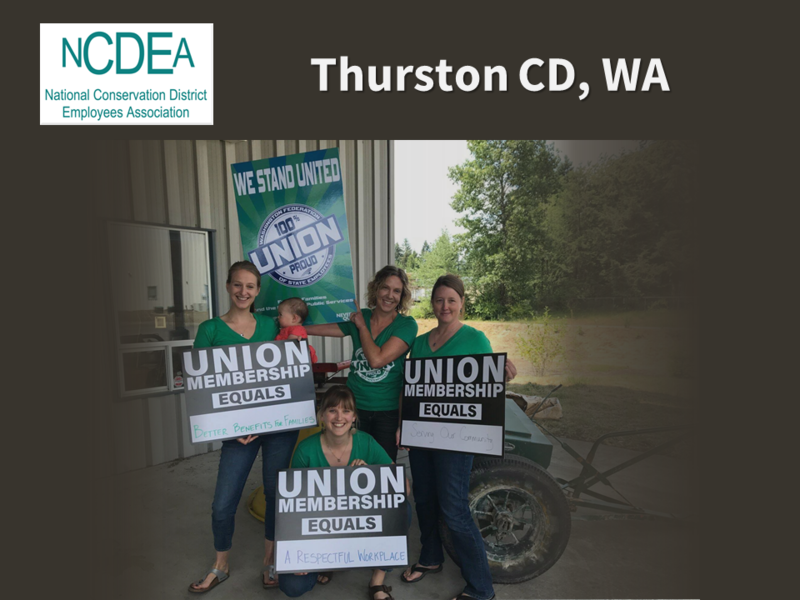 Our by-laws say nothing about union activities because we are not a union. 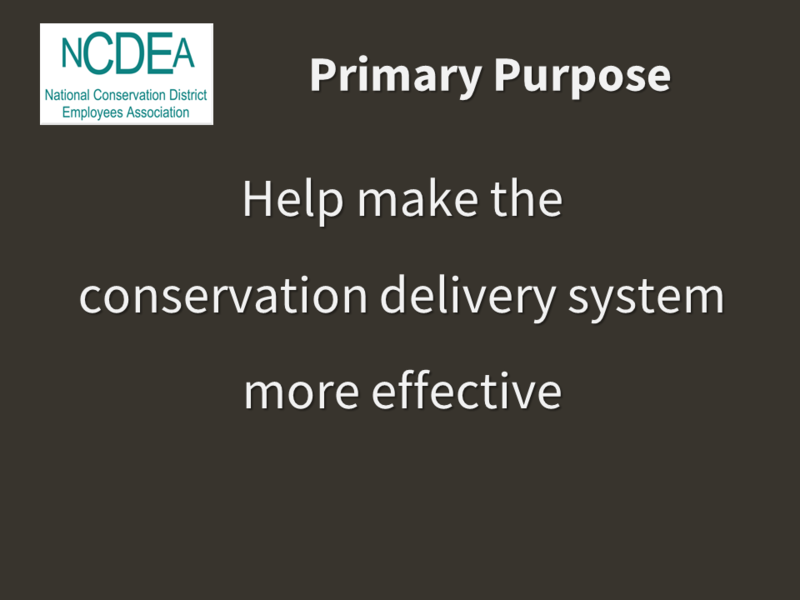 We exist to help improve the conservation delivery system. 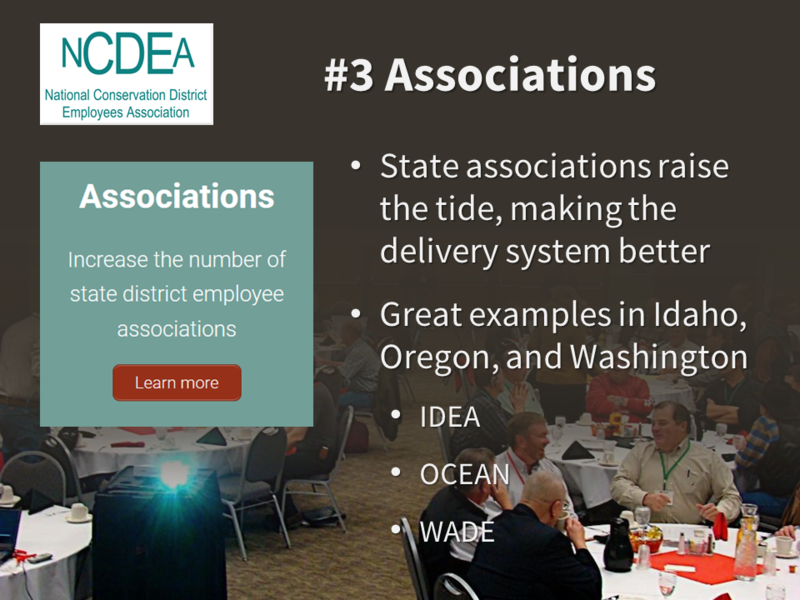 The third most urgent priority is to increase the number of employee associations. We have great examples in our region. 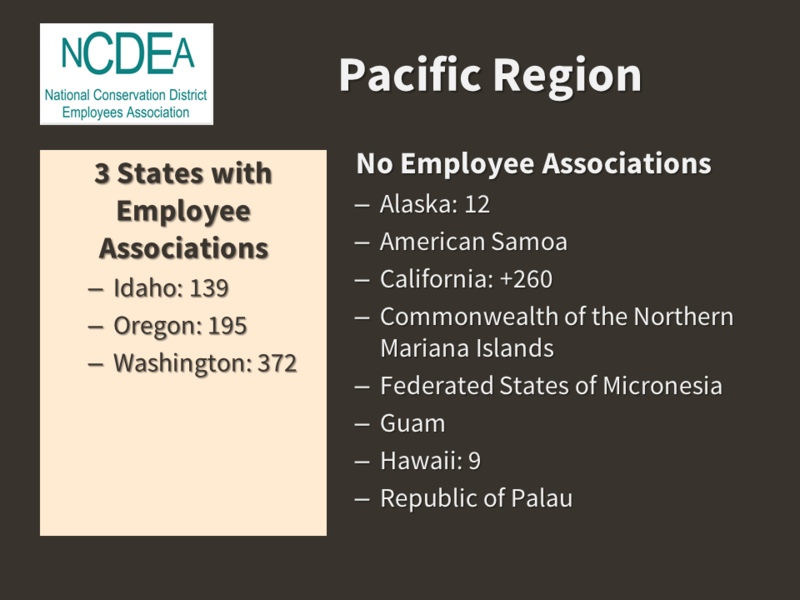 But our three states are the only ones in the Pacific Region currently buoyed up by employee associations. California seems like a likely candidate for improving the delivery system by increasing employee capacity. 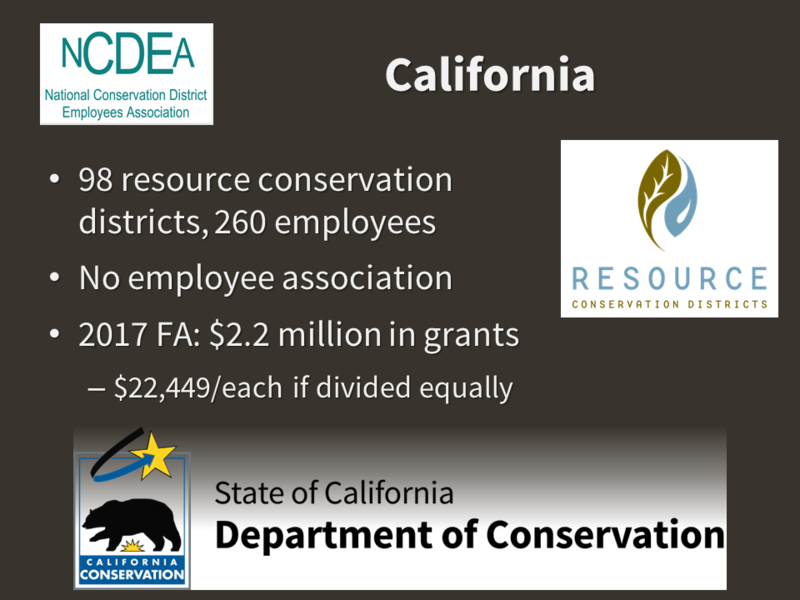 And #4 is improving access to resources for district employees. 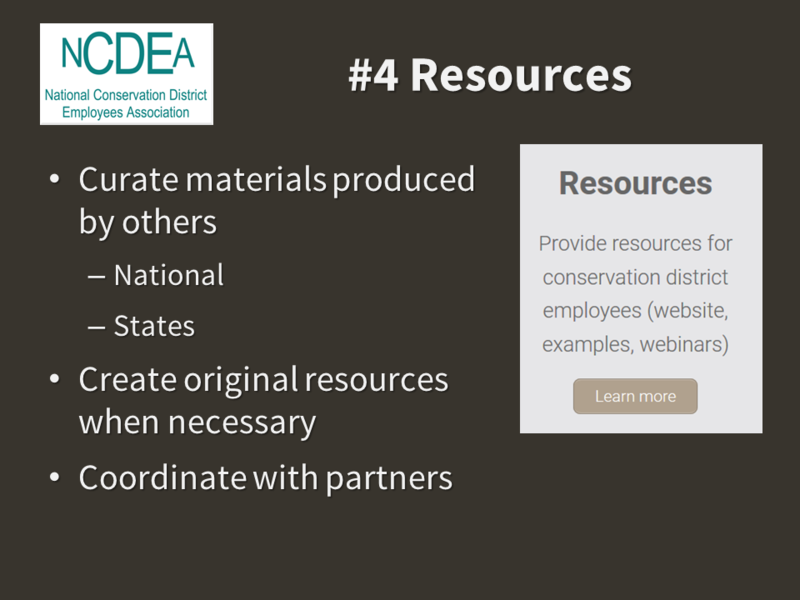 What I envision is NCDEA curating materials created by districts and our partners so that employees have a single place to go to find the information they need. In the Pacific Region, I maintain a website. 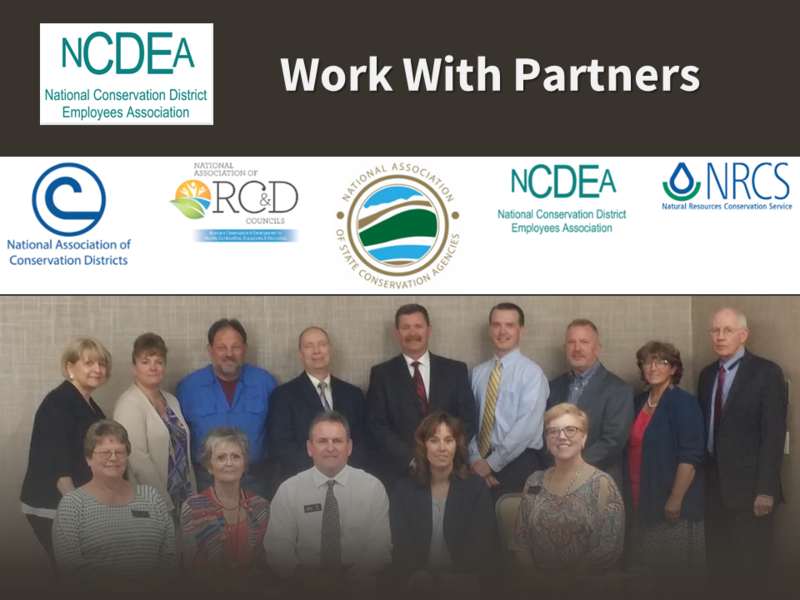 I’ve also been representing NCDEA at many meetings. 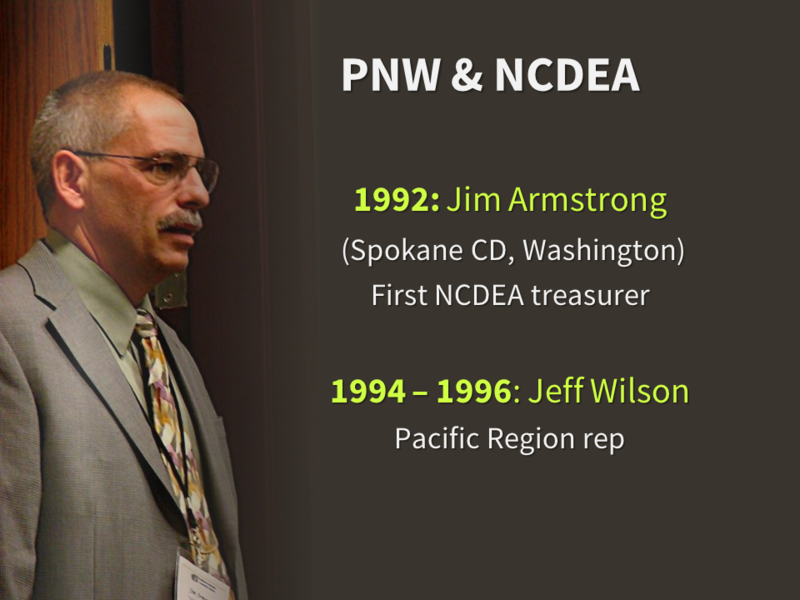 We have a long and strong history with NCDEA in the Pacific Northwest. 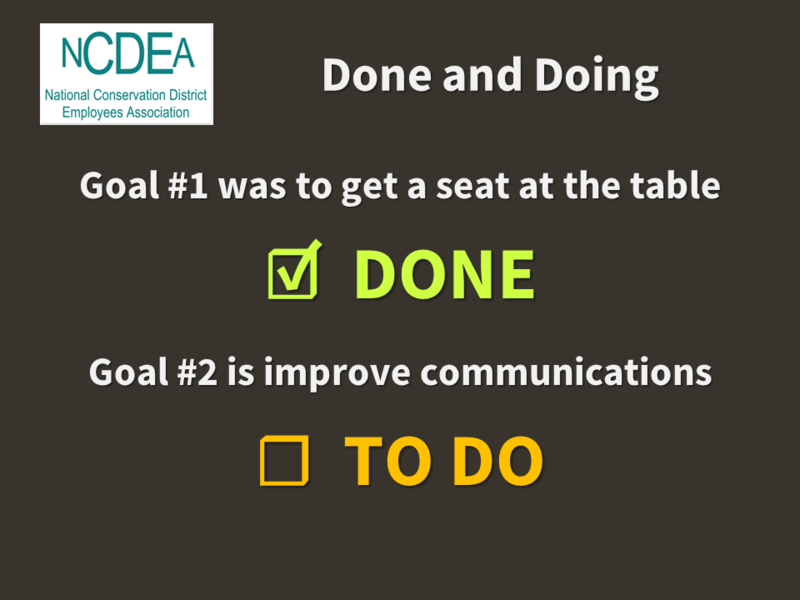 We’re at the table, and now we’re focusing on improving communications. 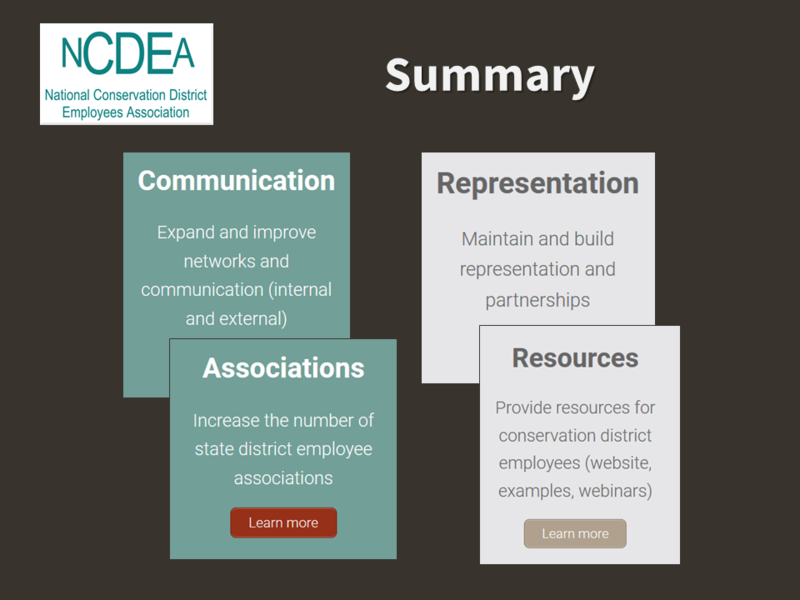 We are here to help make the conservation delivery system more effective. 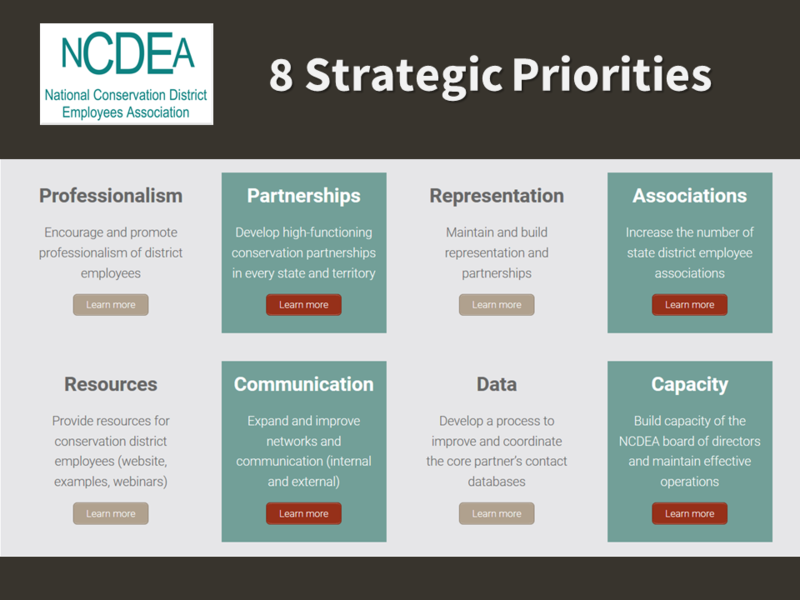 We have 8 current strategic priorities.